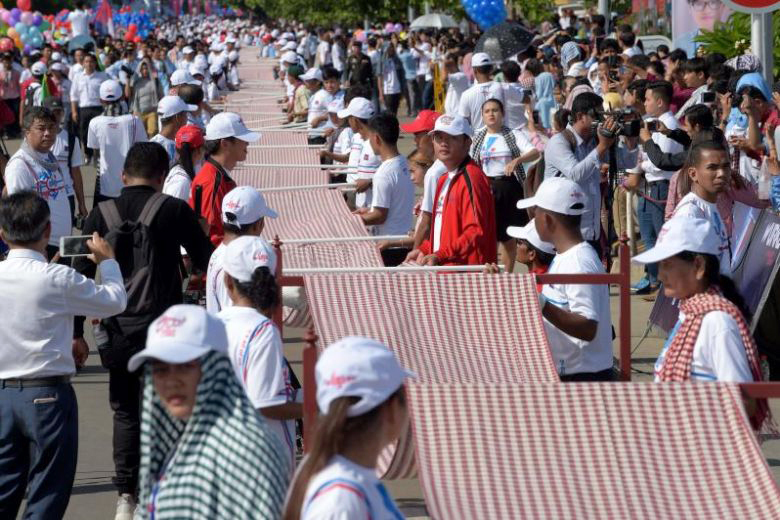 PHNOM PENH – Cambodia’s longest hand-woven scarf, or krama in Khmer language, was included in the Guinness Book of Records as the longest scarf in the world on Sunday (July 1). The 88cm-wide and 1,149.8m-long krama was taken nearly five months to be made by weavers from 20 krama weaving communities, and thousands of visitors had also added a few centimetres to the large krama when they visited its weaving site in front of the National Museum in Phnom Penh. “With 1,149.8 metres, you have set a new Guinness World Record style for the longest scarf,” Mr Swapnil Dangarikar, a Guinness World Records adjudicator, announced to a huge crowd of more than 20,000 people at an event here. Cambodia was the first country that had attempted to break the Guinness World Records for the longest scarf, he said, adding that the basic criteria for this attempt were that the scarf must be 30.5cm wide and at least 1,000m long. Krama, which is made of cotton, is commonly used in Cambodia, and it reflects Khmer culture and traditions, said Dr Sann Vathana, head of GoGo Cambodia, an organisation that launched the longest scarf weaving campaign for the Guinness World Records. Lawmaker Hun Many, president of the Union of Youth Federations of Cambodia, said it was a “new pride and achievement” for Cambodia. In 2015, Cambodia gained world records for the largest Madison dance involved 2,015 participants and the largest traditional sticky rice cake weighed 4.04 tons. « Another Dramatic Sky over Phnom Penh	» Stunning Siem Reap, Cambodia.